As both a veteran railroad worker and union official responsible for safety, Mike Elliott became alarmed when he learned of trouble-plagued train signals in his home state of Washington. So Elliott, 57, of Tacoma, Wash., pressed his concerns with the Federal Railroad Administration, summarizing the matter in a January 2011 letter. The FRA investigated, and discovered 357 safety violations, including 112 signal system defects. Speaking up for safety, though, only made matters worse for Elliott at BNSF, where he already had clashed with managers. Within weeks the company fired Elliott from his job as a locomotive engineer – an act that a federal jury this summer ruled was illegal retaliation by BNSF against a whistleblower. The June 30 decision by the Tacoma jury, which awarded Elliott $1.25 million but is being appealed, spotlights the unjust punishment that critics say sometimes is meted out to railroad workers who report injuries or safety problems. These critics, including plaintiff lawyers and union officials, along with others who have examined railroad practices, say the harsh treatment reflects old, hard-line management tactics that persist in corners of the industry. Under the 22 federal whistleblower laws administered by the Occupational Safety and Health Administration, American workers who disclose hazards or engage in other “protected activity” are shielded against retaliation by their employers. The protected activities vary by industry, but include reporting injuries, disclosing the misuse of public funds and refusing to perform dangerous tasks that would violate safety rules. OSHA protection covers, among many others, truck drivers, public transit employees, nuclear plant operators and, since 2007, railroad workers. Yet despite the broad safeguards for railroaders – or perhaps partly because of that – complaints of illegal retaliation abound in the industry. From October 2007 through June 2015, OSHA figures show, railroad workers filed more than 2,000 retaliation complaints, although the pace has slowed lately. 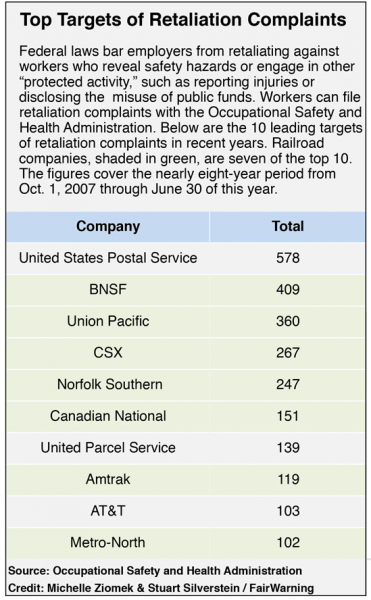 Among the top 10 targets of complaints over the nearly eight-year period, seven were railroads, led by the two largest U.S. railroads, BNSF (409 complaints) and Union Pacific (360). OSHA investigators and Labor Department administrative law judges repeatedly have upheld complaints against the railroads, more than half of which involve illegal retaliation against workers who report personal injuries. In January of that year, BNSF, without admitting wrongdoing, signed an unprecedented accord with OSHA after the federal agency alleged that several of the company’s policies discriminated against injured employees. Among other things, the accord eliminated giving demerit points to workers who report injuries. The alleged violations defy a key intent of federal whistleblower laws: to encourage employees who discover possible hazards to come forward before an accident happens. The potential value of such an early warning system is underscored by the deadly passenger rail accidents and oil train wrecks in recent years. Likewise, safety advocates say, the ability of workers to report injuries without jeopardizing their livelihoods is crucial in a field with many hazardous jobs. Railroads have relatively high rates of on-the-job fatalities – although the toll has fallen dramatically over the last three decades. What’s more, injury totals may be substantially higher than reported. In 2012, amid widespread suspicion that railroads were undercounting injuries, in part by pressuring workers not to report them, the industry dropped its 99-year-old annual Harriman safety award, which was largely based on employee injury reports. Norfolk Southern, which had won Harriman safety “gold award” 23 years in a row before the honor was scrapped, was the target of 247 whistleblower complaints during the nearly eight-year period tracked. That was the fifth-highest total among all U.S. employers. Railroad whistleblowers under federal law must first file complaints with OSHA; they can pursue their cases through conclusion with the agency or, if their issues haven’t been resolved, after 120 days they can opt out and take their cases to court. 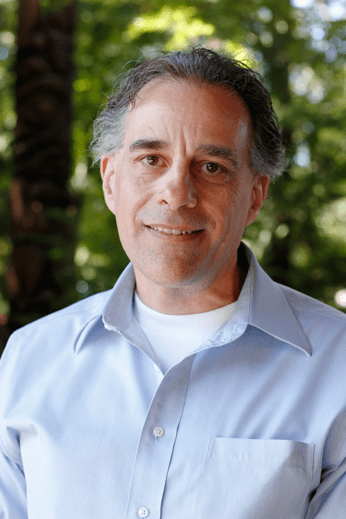 –Mike Koziara, 55, who in March won an award of $425,725 after a federal jury found that BNSF illegally fired him for reporting an on-the-job injury. In September 2010, Koziara, a 32-year veteran of the company, was a section foreman, a job that put him in charge of track maintenance for a 40-mile stretch of rail along the Mississippi River in Wisconsin. The day he was hurt, Koziara was leading a group of employees tasked with removing large, wooden planks from a road crossing in East Winona, Wis., when he was struck in the left ankle by a 1,200-pound plank. “It hurt,” Koziara said, but he didn’t think it was serious. Three days later, after the 72-hour period allowed for reporting injuries was over, he went to see his doctor for a physical. There, she took one look at his leg and sent him for an X-ray. The results showed Koziara had a cracked tibia, or shinbone. He reported the injury to BNSF the next day. A few days later, the company charged him with failing to be “alert and attentive.” As punishment, he was given a 30-day suspension and a one-year probation. But it didn’t stop there. While the railroad investigated Koziara’s injury, it learned that he recently had given about 20 used rail ties to a local farmer. Koziara maintains he had gotten permission to take some ties – and that it otherwise would have cost the railroad money to dispose of used ties – but BNSF charged him with theft. He was fired on Nov. 9, exactly two months after he was injured. –Steven Annucci, a coach cleaner for Metro-North Commuter Railroad. Last December OSHA found that he should receive $250,000 in punitive damages, the maximum permitted in a railroad retaliation case. Annucci hurt his knee in November 2011, when he tripped on a wooden board sticking up about six inches above a paved walkway in a train yard in Stamford, Conn. General Foreman Prena Beliveau drove Annucci to the hospital. On the way there, Annucci secretly recorded their conversation. According to OSHA, Beliveau told Annucci that if you have an injury on your record at Metro-North you’re not going to move up — you’re going to be a car cleaner for the rest of your career. Beliveau also said everybody at Metro-North who gets hurt is written up for safety. Annucci reported the injury anyway. A couple weeks later, Metro-North formally reprimanded him for safety violations, although he kept his job. A year later Annucci was charged with failing to properly clean vomit from a train car, and was reprimanded again. In its December ruling, OSHA found that “animus is clear in this case” and ordered Metro-North to pay Annucci attorney’s fees and $10,000 in compensatory damages, along with the punitive damages. –Union Pacific apprentice machinist Brian Petersen, 31, who was fired after a co-worker drove over his feet in the parking lot of a train yard in North Platte, Neb.. In a pair of rulings last November and February, the railroad was ordered to pay Petersen more than $400,000 in back pay, attorney fees and damages. In the spring, the two sides reached a confidential settlement. The case stemmed from a 2009 accident. Petersen claimed he was leaning against his car, checking his cell phone for messages, when a colleague roared into the space next to him. Union Pacific concluded that Petersen was inattentive and careless, then fired him a few days later when he was seen standing on some motors to write down their serial numbers when he should have been using a ladder. Experts often trace railroad managers’ behavior to the way the industry emerged in the mid-19thcentury. Back then, many railroad officials came from the officer ranks of the Civil War armies. “It was traditionally an industry in which the boss is the absolute boss … all the way up the hierarchy. You don’t question the boss’ authority,” said historian Maury Klein, the author of a half-dozen books on railroads. To this day, railroads remain discipline-minded. Operating and safety manuals run hundreds of pages. Suspected violators, including workers who get hurt, face internal investigations. Safety has improved substantially in recent decades, Aldrich and other experts say, but the pressure on middle-managers to move as quickly as possible while also holding injuries to a minimum still creates incentives to ignore or conceal mishaps. “I don’t think this is a problem that’s going to go away,” Aldrich said. Defenders of the industry say the volume of whistleblower cases isn’t a good barometer of actual wrongdoing because the discipline in dispute often stems from violations by the employees that are completely unrelated to their injuries. “In many cases, the [employee’s] argument is simply, ‘Well, the railroad managers didn’t like the fact that I reported my injury so they were looking for an excuse to get me,” said James Whitehead, a management lawyer who has represented railroads and who teaches employment law at the University of Chicago. Experts say much of the worker litigiousness stems from a 1908 law that excluded railroad employees from state workers compensation systems. Instead, it required them to go to court if they wanted to seek compensation for on-the-job injuries. That created a strong market for personal injury attorneys who specialize in railroad litigation. 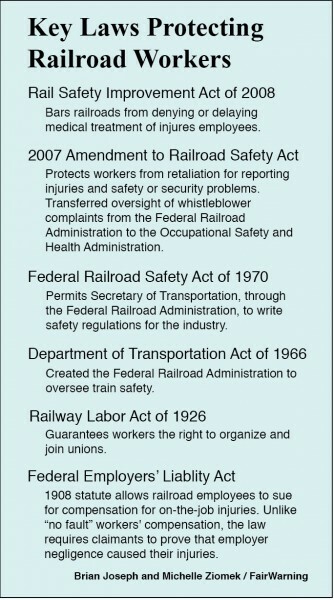 And those lawyers were quick to file whistleblower complaints after Congress in 2007 and 2008 modified the Federal Railroad Safety Act, adding anti-retaliation measures for rail workers. As a result of those measures, railroad employees often have a lighter burden of proof when they pursue retaliation claims than do workers in other fields. Likewise, railroad employees often have rights other workers lack, such as the ability to file complaints over alleged retaliation due to reporting personal injuries. They also can take claims to federal court if their cases aren’t resolved within 210 days – a prospect that railroads often dread. “There can be a lot of emotion in these cases, and they can be challenging cases to defend” when they go before a jury, Whitehead said. Mike Elliott’s case reflects the workplace tensions that sometimes smolder in the railroad industry. The beginning of the end for Elliott at BNSF came in March 2011, when he was chairman of the Washington legislative board of his union, the Brotherhood of Locomotive Engineers and Trainmen. Kautzmann, in a memo describing the March 2011 confrontation, said he followed Elliott into the parking lot simply to make sure Elliott understood the details about an upcoming engineer recertification evaluation. He said he brought along another BNSF employee “to assist me in having Mr. Elliott stop.” Kautzmann said he then stepped in front of Elliott’s car, but Elliot didn’t stop and ran into him, throwing Kautzmann onto the car’s hood. After that, Kautzmann said, Elliott angrily got out of the car and punched him in the mouth. Kautzmann pressed charges after the parking lot incident, and Elliott was criminally prosecuted, but a jury acquitted him. Yet BNSF conducted two internal investigations, and issued decisions both times calling for Elliott’s firing. A federal arbitration board upheld the findings. At the federal trial challenging the firing, BNSF argued that Elliott’s firing couldn’t have been retaliation for reporting safety problems because it had little knowledge of Elliott’s recent contacts with federal regulators. But Elliott’s lawyers presented evidence that BNSF was well aware that their client was in touch with regulators in the months before his firing. For instance, the lawyers pointed to an email about train signal problems that Elliott sent to a government official, and “cc-d” to company officials, in September 2010, several months before the federal inspections. Despite winning the federal suit, Elliott expects a drawn-out appeals process, and he has decided against seeking reinstatement to his job at BNSF. Instead, he is working these days as a lobbyist and spokesman for the union. The role is crucial, he says, because his former co-workers at BNSF need someone to speak out about safety issues. FairWarning (www.fairwarning.org) is a nonprofit news organization based in Los Angeles that focuses on public health, safety and environmental issues.